Here are 5 more 5 Workshop tips and tricks! 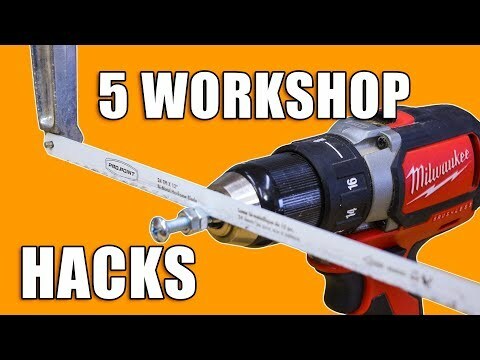 Making things easier and safer in the workshop means changing the way we do things like routing extension cords, adapting drill bits, using pegboard for innovative ideas, and more hacks for magnets! Magnets properties are amazing and can be used almost everywhere, yours is a good idea Colin. Thanks for sharing!! Thanks for sharing those tips Colin!! Those drill bits usually called something like self centering bits, hinge bits, or vix bits, and are worth their weight in gold. Everyone should own a set. Thank you for all the info. It’s not only made me more excited to start projects but has also made my projects easier and even more professional looking. As a newbie to wood working and building I really do appreciate all the tips and tricks. What great tips. thank you for sharing. I look forward to your educational videos. Great tips on the pegboard. I was running into the problem with the holes wearing out and now I know how to fix it. I almost hate to point out that when you were grinding the spade bit that there on the floor was…a coiled up extension cord! Great hacks, I especially liked the peg board tip for drawing arcs and circles. Colin, thanks for your tips. The stepped drill is a handy tip, but the cutting edge of the wide portion was sloped the wrong way so it dragged rather than cut. I’d be interested to see the result in the same piece of wood if it was chamfered in the correct direction so it actually cut. Great info! Thank you for your time! Hey Colin. Great tips again! Most useful for me was the tapered drill bit and both peg board tips! Thanks for posting. Only downside about the "jig" to wrap cables up on, is that it will generate more heat and magnetfield when not unwrapped, and the usage amps of the powertools is high. Hi Colin, thanks for more great tips. On my peg board I glued washers the same size as the holes and that stops a lot of wear if you cannot get the drill bits.. It’s very difficult here in the UK to get the same types of drills. You can get but can be very expensive! More tips excellent thanks Colin.